When I run the setup.exe it asks me for a file and cannot identify the bin files (I got all of them and they are all in the same directory as setup.exe), so I have to cancel. What else do I have to do to install it? Can you post a screenshot of your installer folder ? I've also brought a minor edit to the offline exe to run it with the same permissions as the process that started it (and disable the "Do you want to allow the following program to make changes to this computer" popup). I'm having a similar issue as someone a few years ago, but the resolution was never given, just that the issue had been resolved. I have downloaded and installed the game as per the instructions on the front page of the thread, but when I go to launch the game from the homescreen shortcut, I get "Error Code: 2" after trying to run the story mode. When I try to run the .exe named "PsuIlluminusOff" I get sent to a Game Guard website. The other .exe "PsuIlluminus" just brings up a screen briefly before shutting the program. I also tried multiple times to run the update to get the English version to run, but it has said "Access Denied: Press Any Key To Continue" at which point I press a key, coninue, the .bat file disappears and the game launches with an English home screen, but then the "Error Code: 2" message appears. I was wondering what the fix was for the Error Code or if I have done something wrong somehow? It's probably the script which doesn't execute properly, for whatever reason (permission, environment variables aren't set correctly, etc..). It'd be too much troublesome to find what went wrong and explain you how to fix it. Drag and drop the selected files and folder into the game folder, overwrite every existing file when asked. Then delete (or put in the GameGuard folder) the GameGuard.des file, and you're almost done. Finally, press Windows + R then input (without the quotes) "%LOCALAPPDATA%\SEGA\PHANTASY STAR UNIVERSE Illuminus\PsuIlluminus.ini" replace the "J" on the "Language" line by "AE", save and close the textfile. I confirm you that the "PsuIlluminusOff.exe" is the crack you've to use to play offline. About your problem, I'm unsure why you can't extract files from the archive, and there's nothing I can do on my side. Where the game is installed (C:\Program Files (x86)\...) ? What kind of Windows account do you have (administrator or standard) ? This archive isn't a *.zip, but a *.7z : did you change its extension ? What did you use to open it ? Was it 7-Zip ? If you have multiple hard drives, don't install PSU:AotI on the one where Windows is located. If you can't, at least, don't install PSU in "Program Files (x86)". And if you're unsure if your file archiver handle correctly *.7z (or *.exe) archive, use 7-Zip ("32-bit x86" if you don't know if you run a 32 bit or a 64 bit v. of Windows). And don't change the archive extension once you've downloaded it. I bought the physical copy of AotI and installed it. I downloaded the file and extracted it into my PSU location but now what happens is when I try to start the game, the screen goes black, then returns back to the desktop and nothing else happens. I can keep repeating this and the same thing will happen. When I press Story Mode, I get "Failed to launch Phantasy Star Universe. Error Code:2". This is exactly how it looked like after everything was done to the last step. I don't know why, but your installation is incomplet/corrupted. Several files are missing, like LangJ.bin or PsuIlluminusOff(.exe). I don't get why you don't have the LangJ.bin : it comes with the game installer, and my patch doesn't affect it in any way. Are you sure to have correctly installed the game ? To have placed the setup-1a.bin (2,099,491,584 bytes), setup-1b.bin (2,100,000,000 bytes), setup-2a.bin (1,275,777,478 bytes) and setup.exe (514,312 bytes) in a same folder ? Try to uninistall the game, re-dl the files if size doesn't match (which result of a dl corruption) and re-install the game ? Ok I uninstalled the game and reinstalled it with my firewall and anti virus turned off. 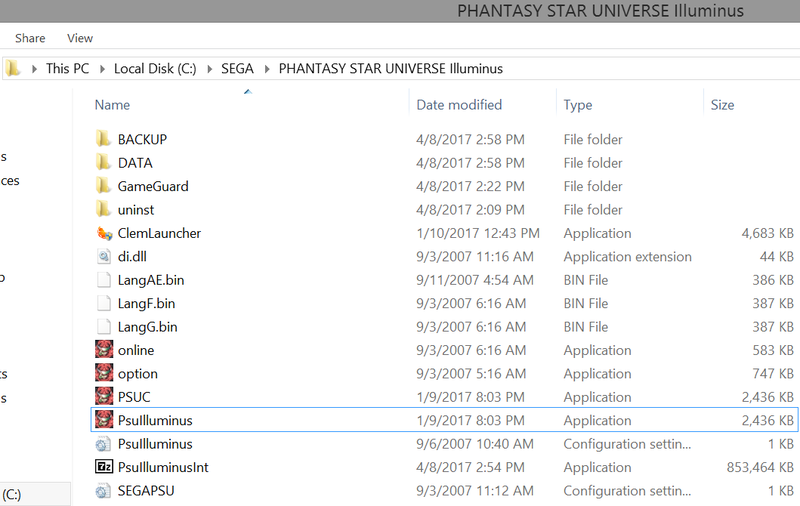 Installed DirectX that comes with the installer, downloaded PsuIlluminusInt.exe and placed it into the PSU game file, did the Patch and after the patch the PsuIlluminusOff.exe goes away and shows exactly how the files come up in my picture before. Although while launching the Patch, it does say Access Denied when it prompts me to press any key, then press any key again and its finishes/closes. Are the Setup files only for people who dont have a copy of the disk? I thought that was just the files to install the game which I already did with my PSU AotI disc.